19.54 A convoy of cars from Graz (Austria) will arrive in Röszke in about half an hour. 18.34 Article about the convoy which left from Vienna this morning. 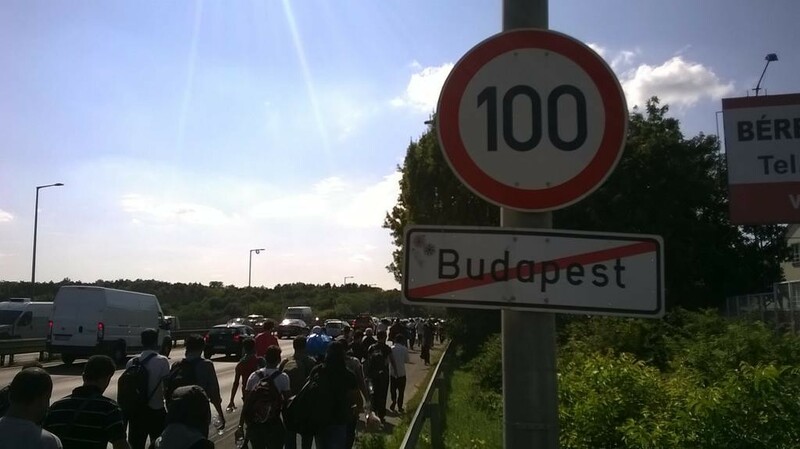 17:45 According to the Hungarian police, they arrested only 1.002 irregular border crossers in the last 24 hours. Some days ago, the number was between 2.500 and 3.300 daily. 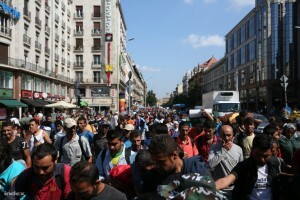 17:15 There are not many refugees at Keleti at the moment. Cars and trains permanently transport them to the border. 14:12 According to No Borders Serbia nearly 1.000 refugees who started last night at 10 pm by train from Belgrade to Subotica (just over the Serbian border with Hungary) were stopped at the train station in Subotica. 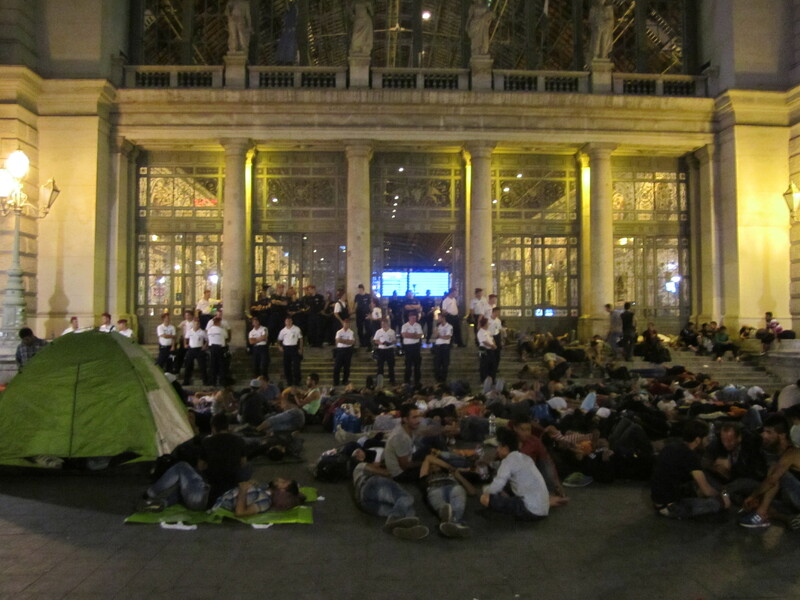 13:10 This night only a few hundred refugees slept at Keleti, we were there. 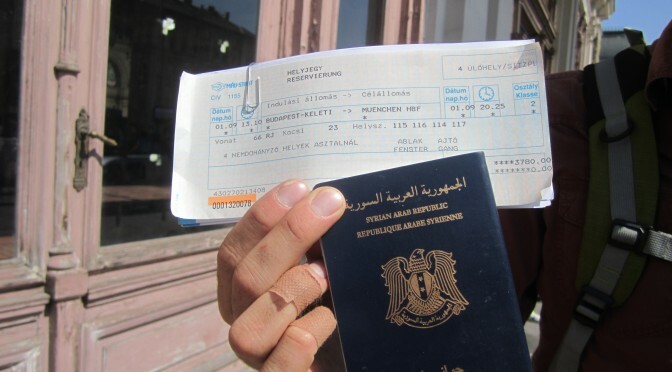 Refugees can still use trains to Hegyeshalom and cross the border to Austria there. 13:22 We got the information, that the first buses arrived in Austria. 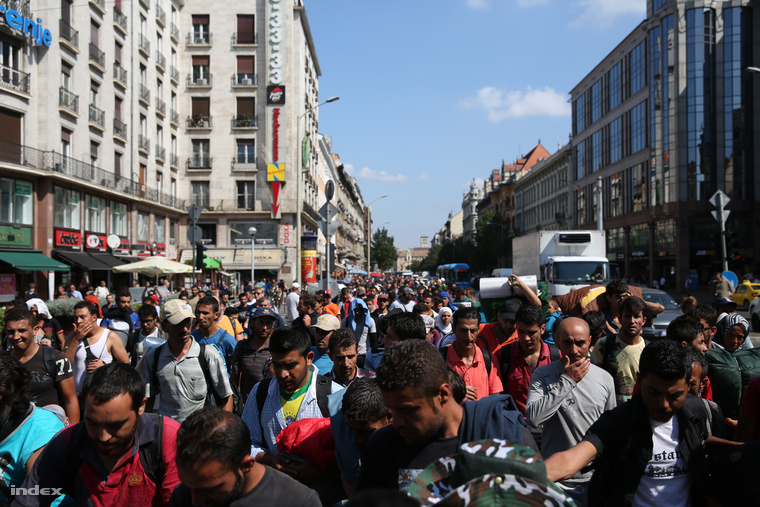 15:55 The first 250 refugees from Budapest arrived in Munich around midday. There is a warm welcome for them. Bavarian police is expecting 5.000 to 10.000 the next days. Christoph Hillenbrand, President of Upper Bavaria (the region where Munich is located), stated „humanitarian management“ is more important than legal questions or registration at the moment. Photos from Munich. 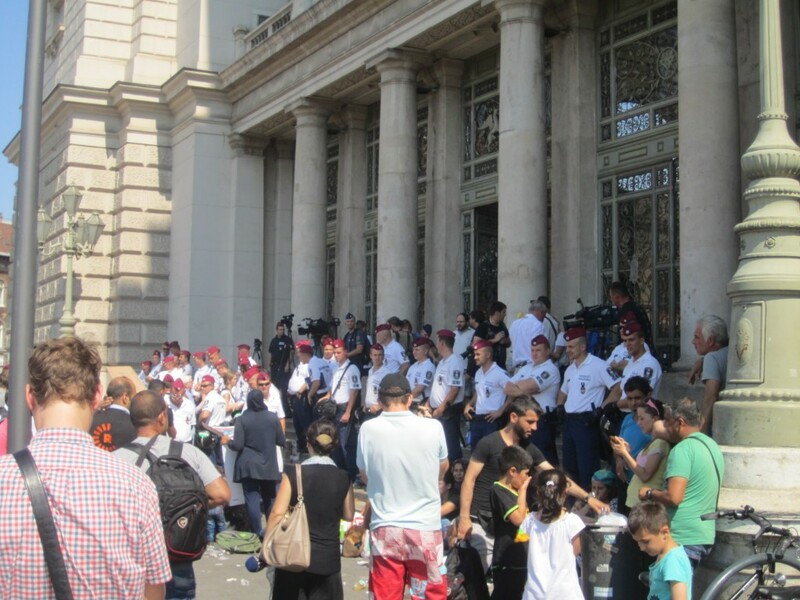 23:41 It has been circulating for a while in the international media, that most of the people at Keleti are not registered in Hungary. This is just not true. 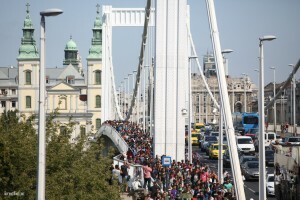 The overwhelming majority had already given their fingerprints directly after they crossed the Serbian/Hungarian border because Hungarian police forced them to do so. Furthermore, it is not true that under the Dublin-Regulation Hungary is obliged to prevent the refugees leaving the country. The logic behind the Dublin-Regulation is another one: A state has to take back a person after an irregular border-crossing not already preventing it. 21:41 Even though thousands of refugees left with trains and the #marchofhope thousands still are at Keleti. This video is from 8 p.m.
17.45 #marchofhope is close to Biatorbágy now (map). 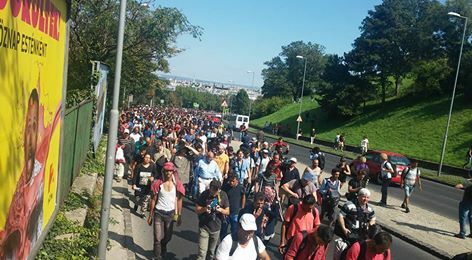 17:34 There are reports and footage on twitter of a march of 300 refugees that have broken away from the train in Bicske. That would make the second march. 17:17 Several sources reports attacks by football hooligans on refugees at Keleti, police is intervening, refugees are fighting back. index.hu is reporting the first death in Bicske: a 50-year-old refugee from Pakistan fell and hit his head. We are trying to confirm, while there are reports of heavily armed riot police gathering in Bicske. 16:52 More and more observers of #marchofhope estimate participant numbers in the several thousands, not just some hundred. 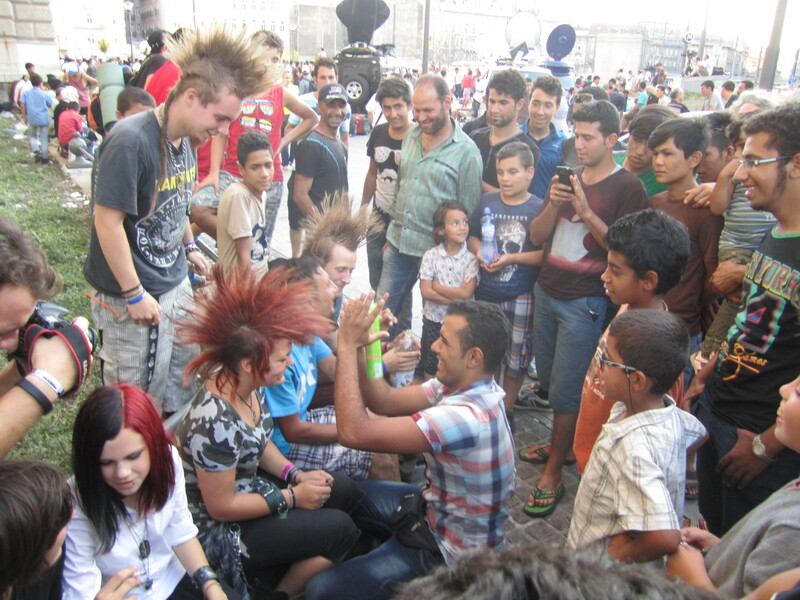 16:47 Nazi attack at Keleti, fire crackers thrown into a group of refugees. No injuries we know of, and police protected the nazis as they were confronted by the refugees. 15:07 #marchofhope has passed the 7 km mark. 14:54 Hungarian police is using tear gas in Röszke camp. 14:29 On a side note. 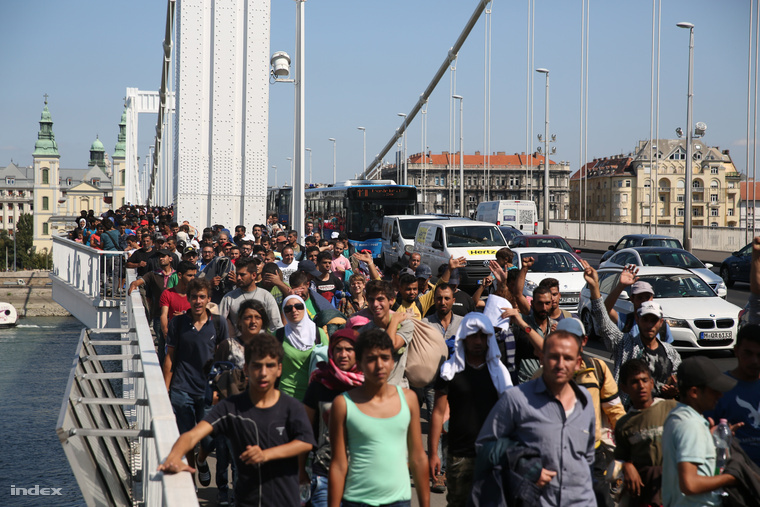 According to Hungarian police, apprehensions of refugees at the HUN-SRB border in the last 24 hours reached 3.2003313, that is an all time high. That fence is sure working out well. 14:20 In Bicske, situation has not changed. 14:14 The 300 refugees that have escaped from the camp in Röszke have been reapprehended by the police. 13:39 We hear that at least 1.000 refugees have just started a foot march from Budapest to Austria, they are currently on a bridge crossing the Danube. 12:32 RT has a live stream from Bicske discontinued, so in short: situation unchanged, train still surrounded, refugees are shouting slogans. A lot of media present. [13:41] the live stream seems to be back online. 23:58 Situation has still not changed, but other refugees that have been pulled from later trains also refuse to be transferred to the camp. In the meanwhile the deputy director of OIN, the Hungarian Migration Agency, threatened the refugees in the train with deportation, as their refusal to leave would be interpreted as non-cooperation and would thus void their asylum claims. Empty threats of a bureaucrat. 21:50 Situation is unchanged in Bicske, refugees refuse to be transported to the camp. All westbound trains from Budapest pass through Bicske, the police is stopping them and searching them for refugees, who are then taken out of the train. 20:29 Info from a journalist inside the train in Bicske: around 100 people per carriage, that makes about 600 refugees in the train, which was stopped 8 hours ago. 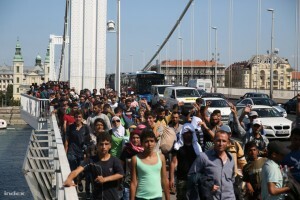 The refugees in the train are very adament in their refusal to be brought to the camp, nobody wants to go there. 20:21 Quick info from Bicske camp. Just now, two busses pulled up, each with at most 10 people inside. Bicske is an open camp that is was mainly used for recognised refugees (a so called „integration camp“) and consists out of some barracks, surrounded with barbed wire, but open, i.e. during its use in the last years, camp inhabitants were free to come and go. 18:31 A video from Bicske, from 16:45. The situation has not changed so far. We suspect that the police will not move before darkness has fallen and the journalists have left. 16:17 We are reporting from Bicske. The train that was stopped there around noon is still in the train station. The whole train is surrounded by police, refugees are however allowed to leave the train and are given water by the police. The train consists of six carriages, we estimate several hundred refugees in the train, with many children amongst them. From the train, we can see hand-written posters with slogans such as „no camp“ and „freedom“ written on them. Occasionally, there is chanting of slogans like „Germany, Germany“. There are several journalists with cameras present, and we count 5 busses on stand-by for transporting the refugees. But for the last 4 hours, there has been no movement. 15:42 Twitter has images from #Bicske. 15:15 smaller protests are starting in front of the train station. 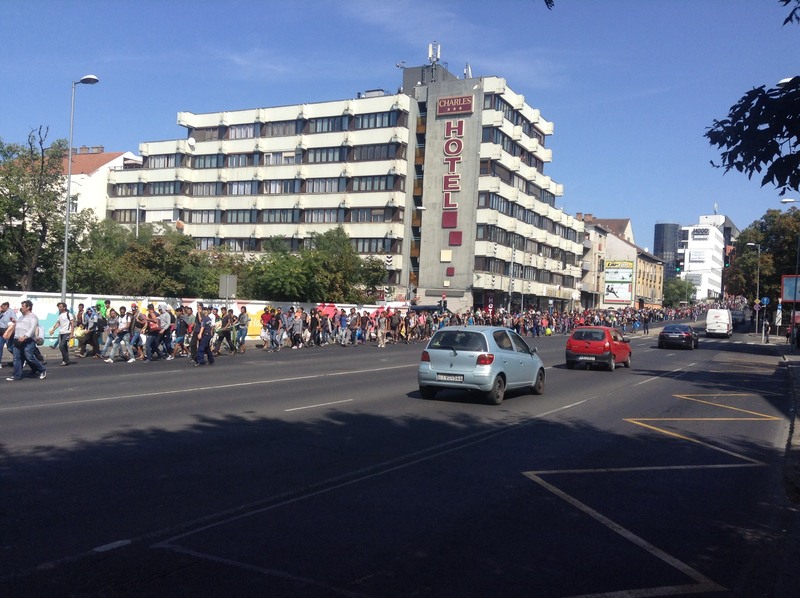 14:02 We hear reports of physical protests in Bicske, as refugees feel betrayed and refuse to enter the camp. We are trying to get to Bicske to confirm, so stay tuned. 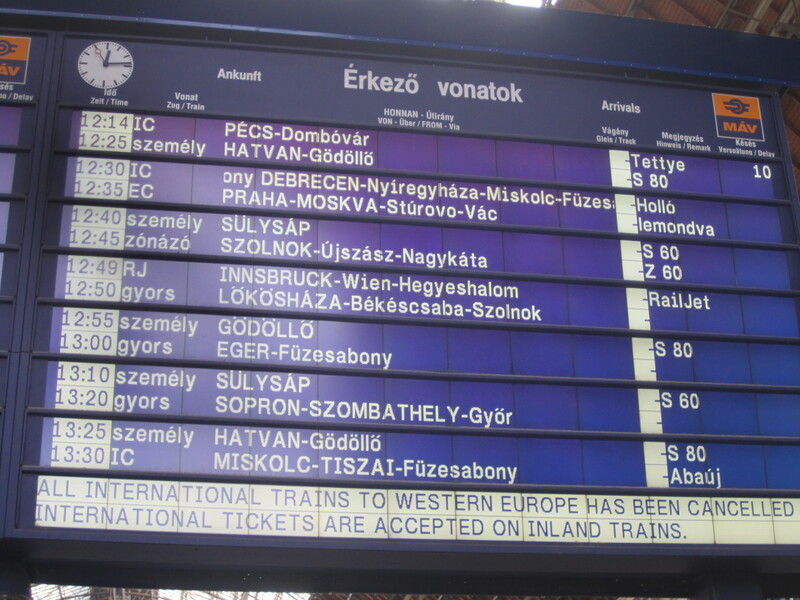 Here is a picture from Budapest train station announcing suspension of all international trains, and a video from today showing the situation at the train station. 12:47 We just learned from a reliable source that the train to Sopron was stopped 30 km outside Budapest, in Bicske, where an open refugee camp is situated. Police has evacuated the train and all refugees were transferred to the camp. 12:36 We are back with the live feed from Hungary, and we decided to switch to English. As different media have already reported, the Budapest Keleti train station is open, refugees are back inside and are boarding trains. However, it seems that all international rail connections have been suspended. We estimate that there are still several thousand refugees around the train station here. 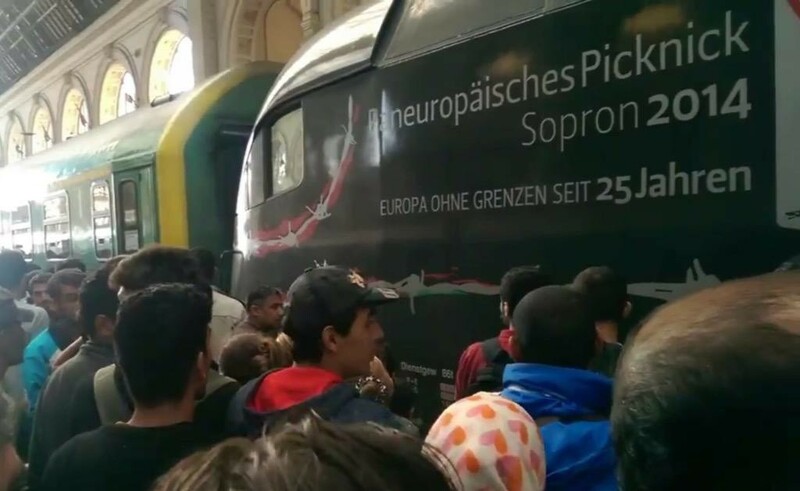 Since there are no international trains, refugees take the regional train to Sopron, a border town with Austria. So how about a Pan-European Picnic 2015? 22:43 Die Lage am Bahnhof Keleti ist relativ ruhig. Die meisten schlafen. Damit beenden wir den Ticker für heute. Bis morgen. 19:42 Vor einem Transporter, aus dem Lebensmittel verteilt werden, kommt es fast zu Auseinandersetzungen. An mehreren Stellen können Flüchtlinge den Bahnhofsbereich verlassen. Die Polizei will wohl nur verhindern, dass erneut Straßen blockiert werden. 19:11 Es wurde durchgesagt, dass alle Flüchtlinge, die noch keine Fingerabdrücke in Ungarn abgeben mussten, dies nun nachholen müssen und alle Flüchtlinge in Lager in Ungarn gebracht werden soll. Es wird in kleinen Gruppen diskutiert, die Lage ist noch relativ entspannt. 19:02 Spezialeinheiten der ungarischen Polizei haben gerade die mehreren tausend Flüchtlinge auf dem Bahnhofsvorplatz eingekesselt und macht Durchsagen auf Arabisch. 18:55 Aus Wien wird weiter berichtet, dass sich immer noch Flüchtlinge auf den Weg nach München machen. Die österreichische Polizei lässt sie auch fahren. 17.30 Die Flüchtlinge haben die Straße am Bahnhof blockiert. Spezialpolizei hat die Straße wieder geräumt. 15:22 Laut einer Meldung des Tagesspiegel soll in der Nähe des Bahnhofs ein Zeltlager für 800 bis 1000 Menschen errichtet werden. Hier eine Einschätzung von uns von heute Früh. Sind nun auf dem Weg zum Bahnhof. 00:11 Mit diesem Foto beenden wir den Ticker für heute in der Hoffnung, dass bald eine vernünftige Lösung gefunden wird. Diese kann ausschließlich sein, den Flüchtlingen schnellstmöglich die Ausreise zu ermöglichen. 23:25 Aus Wien hören wir, dass immer noch Flüchtlinge aus Ungarn ankommen, mit dem Zug. Sie erzählen, dass sie an anderen Bahnhöfen in Ungarn eingestiegen sind, diese aber mittlerweile vermehrt auch von der Polizei abgesperrt werden. Um 23:45 wird ein weiterer Zug aus Ungarn in Wien erwartet, in dem sich weitere Flüchtlinge befinden. Die österreichische Polizei unternimmt scheinbar derzeit auch nichts, um Flüchtlinge an der Weiterfahrt nach Deutschland zu hindern. Am Wiener Westbahnhof halten sich noch einige Flüchtlinge auf. 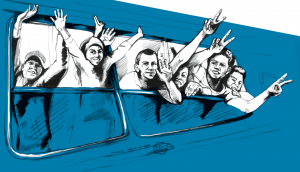 Morgen soll es wohl eine Demonstration in Budapest für die freie Weiterfahrt der Flüchtlinge geben. 23:12 In München kommen immer noch Flüchtlinge an, wir gehen aber davon aus, dass sie schon am Montag nach Österreich gekommen sind. Der Bahnhof in Budapest ist immer noch abgeriegelt für Flüchtlinge, d.h. es ist davon auszugehen, dass von dort heute keine Flüchtlinge aus Budapest Richtung AT/D abgereist sind. Viele Flüchtlinge in Budapest sind aber immer noch im Besitz von Tickets. Diese hatten sie am Montag erworben, ihnen wurde wohl erzählt, sie könnten am Dienstag damit fahren. 19.00 Der Protest ist zunächst wieder abgeflaut. 17:30 Die Proteste dauern an. Allerdings sitzen bzw. liegen die meisten Leute nach wie vor im Untergeschoss oder in den umliegenden Straßen. Wenn einige Medien von hunderten Menschen sprechen, ist dies sicherlich falsch. Hier sind Tausende. 17.00 Es verbreitet sich eine Stimmung, die an den Beginn der „Arabischen Revolutionen“ erinnert. 16:50 Mehrere hundert Flüchtlinge demonstrieren vor dem Bahnhof für ihre Ausreise. Es sind rund 20 Übertragungswägen vor Ort, vor einem von einem deutschen Sender wird „Germany, Germany“ skandiert. Zugang zum Bahnhof für Flüchtlinge immer noch gesperrt, aber auch bisher keine Räumung wie vormittags befürchtet. 13:06 Heute wurde der Bahnhof geräumt, er ist seit dem abgesperrt, und nur unter Vorzeigen eines Passes an den Seiteneingängen betretbar. Rund um den Bahnhof halten sich mindestens 3000 Flüchtlinge auf. Aktuell zieht verstärkt Polizei auf, es kursiert das Gerücht, dass die Flüchtlinge abtransportiert werden sollen. Dies ist jedoch bisher noch nicht von offizieller Seite bestätigt worden.